Installing safety bollards are beneficial when it comes to safety. Safety bollards provide a border and help to guard pedestrians against dangerous work areas and traffic. You’ve often seen these before but may not have known what they’re called. Installing safety bollards are beneficial when it comes to safety. Safety bollards provide a border and help to guard pedestrians against dangerous work areas and traffic. You’ve often seen these before but may not have known what they’re called. Think about the parking lot of your local park. Not only does grass create a visible barrier but safety bollards are highly-visible and create a barrier between people freely running around and the people arriving in vehicles. They also help to section off a property. Keep reading for more detail about the safety benefits of safety bollards. When there is traffic detours, road closures, or traffic diversion in any way, shape, or form, bollards help to alert drivers of what direction to go and how to safely proceed. Narrow roads, sharp turns, and a high volume of traffic, especially on the highway can give new drivers anxiety. Highly-visible safety bollards help to guide their driving so that they don’t hit a curb or cause a collision. Safety bollards come in many different shapes, colors, and sizes. They even come in yellow! Variety matters because driving does not only occur in the daytime. If a bollard is too small or too dark, a driver may not be able to see it during the night time. Strips that reflect light are especially crucial during lowlight conditions or when the weather’s bad. While safety comes first, this investment can match or add to the architectural design of your establishment. Depending on your needs, there are a lot of options and finishes that prove their durability. Steel and stainless steel are popular options. Safety bollards have indoor and outdoor functions. A powered coating will reduce rust and help aid in visibility. Installing these safety mechanisms don’t require core drilling or excavation of any sort. It doesn’t matter if the area uses new or old concrete; the installation won’t be difficult. 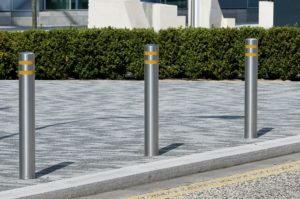 Safety bollards involve built-mounting or drop-inserts. With new concrete, anchor castings or embedded posts are best. This entry was posted on Thursday, March 28th, 2019 at 10:26 am. Both comments and pings are currently closed.